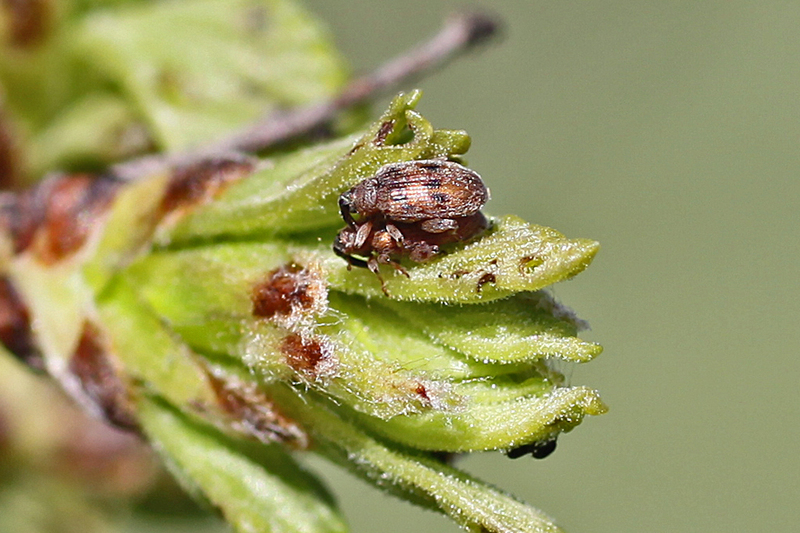 Overwintered European elm flea weevils (Orchestes alni) are attacking emerging elm leaves in southwest Ohio. A close examination will reveal weevils feeding and frolicking (mating) among the newly expanding leaves. Adults produce small feeding holes and females produce additional damage by laying eggs into mid-rib veins and major lateral veins of the leaves. As leaves expand, the feeding holes become larger and more apparent producing the characteristic "shothole" leaf damage associated with this weevil. Damage caused by oviposition also becomes more noticeable with leaves failing to fully expand beyond the vein wounding and the affected area turning yellow and curling downwards. Once the eggs hatch, larvae begin feeding as leafminers tunneling through the leaf tissue toward the margins of the leaves. This non-native pest attacks all species of elms including American elm (Ulmus americana); however, Siberian elms (Ulmus pumila) are particularly susceptible.